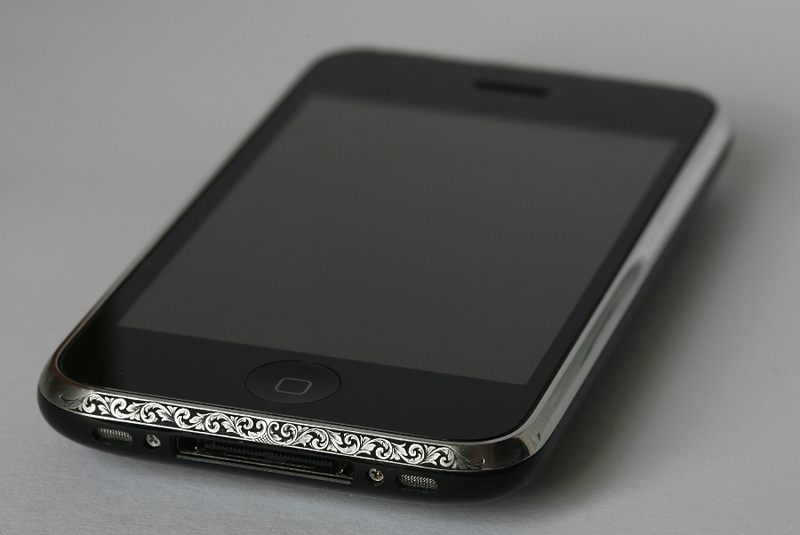 Engraving my iPhone is something I’ve wanted to do for quite some time now, the plain metal border was so tempting. I’ve searched the net, but haven’t yet found any hand engraved iPhones. There are a lot of laser engraved ones and cases, but to me laser engraving is not really a true engraving. So someone must start with the handmade. For starters I engraved the bottom part of it, so when I did screw up, it wouldn’t be too noticeable. The metal seems to be some kind of stainless steel and a very tough one too. I broke many-many graver tips during the process and at least 1/4th of the time was spent on re-sharpening the gravers. Scroll design is very basic and I drew it straight on the phone using china white and pencil. The width of the metal border is 3mm. This section took 8 hours to complete. I’m not yet sure if I’m going to engrave the top and/or sides too. Maybe sculpting and/or some gold inlay? Finally I have something to show when trying to explain what kind of engraving I actually do. Looks great as always Viljo. It’s great to see that you managed to successfully make the jump from coding to forging/knifemaking/engraving. Keep up the good work! On the contrary, it’s good that it can’t be automated. Otherwise 1M other people would have exactly the same looking iPhone. It can be automated, with a well calibrated laser engraver. That is incredible. I could barely draw this, let alone engrave with no ‘undo’ button to reach for. Wow. I think the subtlety of it right now is great. Don’t over do it… with subtractive sculpture you can’t take it back. Find another project, because this one looks great how it is. Thats Super awsome.Can you do mine too? This looks terrific! I have been facinated with metal engraving ever since I saw the Zemaitis guitars. I was thinking, just a few weeks ago, how great it would be to engrave one of those nice metal iPhone4 cases. Very sweet work, I hope you finish it. I think it’s awesome! Is this possible with the metal sides of the iPhone 4? I’ve wondered about iPhone 4 myself, but by the description of Apple, it sounds like a very hard metal: “Created from our own alloy, then forged to be five times stronger than standard steel”. But it could be just plain 303 stainless too. Although they did buy the Liquid Metal company few weeks back, so you never know. Why not, send me an email through the contact form and let’s work out the details. This is brilliant, you have just sparked an incredible interest in engraving for me. Well, implementing into my art anyway. Also about the iPhone 4, isn’t that metal supposed to be the antenna? Might cause some issues? In one way I want the fashion of the future to implement designs like this into everything, but then I don’t want to dilute the beauty by having everything in that style. But I want it. You only can copy the pattern, but a laser never can imitate Viljos cuts, a laser can’t do high polished cuts. The cuts of an engraver like Viljo are absolute unique. In summary it wouldn’t look like the original.